The volcanic island of Nisyros lies north of Rhodes, a craggy, mountainous and fertile speck in the Aegean Sea. It forms part of the Dodecanese Islands along with Kos and Tilos, and is an unspoiled treasure that has so far dodged the onslaught of mass tourism. 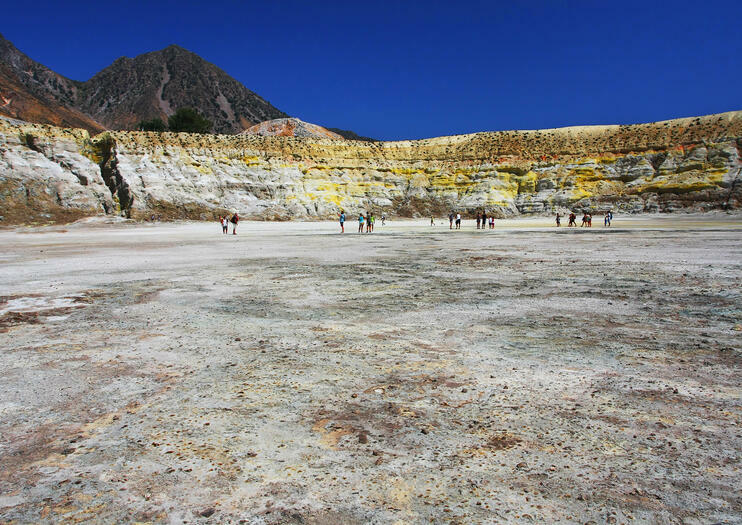 The volcano that forms the greater part of Nisyros last erupted in 1888 but it is one of the most active in the region. Of the island’s six craters, Polivotis is the biggest, measuring 260 m (853 ft) across and reaching a depth of 30 meters (98.5 feet); it steams gently as gases bubble up from underground. Thanks to all this volcanic activity, thermal springs disgorge their sulfurous waters into the sea at several points around Nisyros; visitors flock to the spa at Loutra on the north coast to take advantage of their healing properties, while other hot springs are found at Thermiani and Avlaki. Nisyros’s main town of Mandraki is tucked into hills on the northwest tip of the island, a charming waterfront sprawl of squat, white-washed houses and taverna-lined piazzas. Inland Byzantine chapels such as the Church of the Panaghia Faneromeni are scattered across the landscape, accessible by way-marked cycling and hiking trails, but the most startling of the island’s cultural remains is the Paliaokastro, high on a hilltop overlooking Mandraki. Dating from the fourth century BC, this was once a mighty acropolis and fort but now little survives except for fragments of the walls constructed out of volcanic basalt, although two towers have been recently remodeled out of rock surrounding the site. Nisyros lies in the Aegean Sea north of Rhodes, with twice-weekly ferry services operating between the two islands; crossing time is around 3.5 hours. Get the full Greek experience with this multi-part tour: take a 1-hour cruise to Dodecanese Island and then enter a volcano where you can feel rumbling lava at your feet. After visit the Panagia Spillani monastery and learn about its history. Spend a day on the water on this full day adventure exploring smaller communities to the south of Kos in the Dodecanese islands. Depart from the local port to the island of Nisyros, a volcanic island that is home to the largest caldera in Europe. Then, on to the capital of Nisyros, Mandraki, for some shopping and free time. Return to the boat for lunch (included) and enjoy time to sunbathe or go for a swim before returning to Kardamena harbour.